If you have read my article about the 3 most important stumbling blocks for Captivate (newbie) users, you’ll know that Themes are amongst them. The components of themes are described in What’s in a Theme/template. and in this post you’ll learn about he use of Theme colors. Almost daily I see questions, comments on the forums like “I don’t use a theme” which is – sorry for the word – nonsense because every project is based on a theme. The theme with the least intrusive design is the Blank theme, which has no color palette and only offers the minimum set of 6 master slides. The feedback captions use an appropriate style in the themes Easiest way to solve the problem would be to change Preferences, Defaults and choose for captions if that is not messing up your design. Below you’ll read how to ecit the themes. C:\Program Files\Adobe\Adobe Captivate 2017 x64\Gallery\Layouts10_0\en_US. You’ll also find the ThemeColors folder in that location. The included themes are: (Blank), Blue, Clear, Clean, OldPaper, Poise, Suave, White (which is the default theme). All themes are responsive, but can be used for normal, blank projects. If a theme seems corrupted or is too messed up, you can always restore it by copy/paste from the Gallery (need for administration rights). If you have both CP9 and CP2017 installed, you’ll see both Layouts in the copied folder. But the layouts folder for CP2017 has a subfolder ‘bpthemes’ containing all the CP9 themes on my system (not sure if that is the case when you only have a CP2017 install). TIP: don’t put custom themes in the sames folder as the default themes (Public). If you have to restore all themes by deleting the Layouts folder you will not lose the custom themes. I store them mostly with the project(s) they are used for. I suspect you will want to keep the correct object styles for the feedback messages for future projects as well. Use the menu Themes, option Save Theme. The result will be that the theme is edited in the copied folder, in the Public documents To change the original theme in the Gallery, you’ll need to do it outside of Captivate, using Explorer and needing administration rights. However a user yesterday reported that the option ‘Save Theme‘ was dimmed(?). Reason was that he was working in a blank, normal project. All default themes in CP2017 are responsive. To protect the responsiveness, you have to edit the theme from within a responsive project. The option ‘Save theme’ will be available in that case. You can always use a responsive theme in a normal project. What about importing themes from another source outside of Adobe? For instance, branded themes from clients? 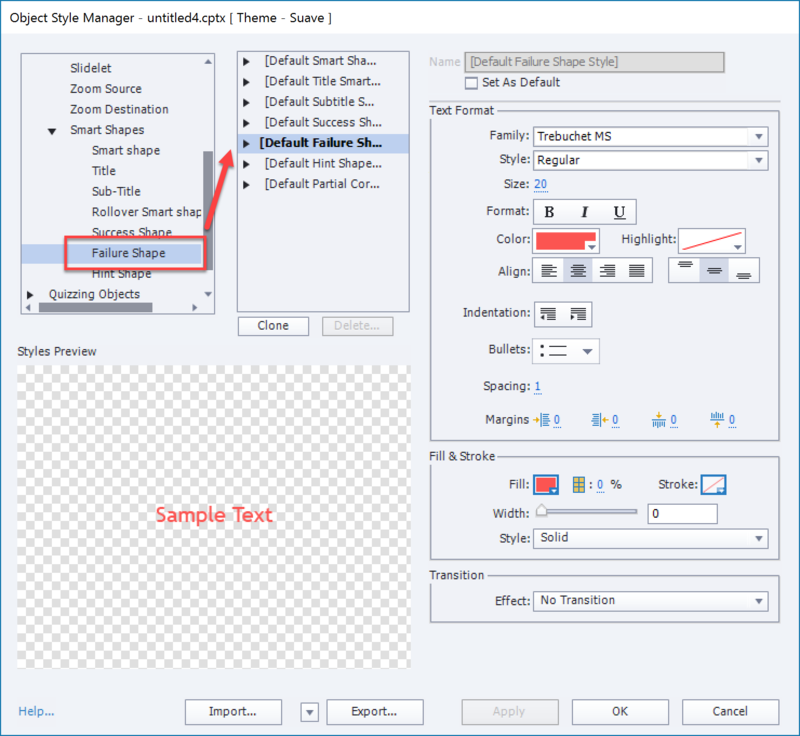 You don’t import a theme, you apply it to a Captivate cptx file, by using the Browse button in the Themes thumbnail box opening with the big button Themes. As I wrote, a theme can be saved in a file with extension cptm. You can always use a theme with another Theme Colors palette, if the colors are used in a consistent way in the theme. Look at my third requirement above. Great post, and your original article is super helpful, too!